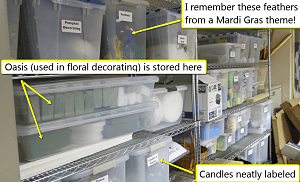 This nonprofit uses an oversized closet to store labeled acrylic boxes filled with craft supplies. Because January is the month that many stores — Home Depot, Walmart, Kmart, Target, Staples, The Container Store (the annual Elfa® sale) — advertise one particular theme. This is THE month that stores promote organization. I suppose a common New Year’s resolution is to “get organized” in the fresh year. It might have to do with the fact that many people are taking down their holiday decorations and shoving them back into torn cardboard boxes and over-cramped basements. The idea of a neatly organized basement or attic begins to rank higher in their priorities. This school has a room set-aside for production of the gala. One wall has these storage containers. A large walk-in closet holds more supplies. When we think about “organizing a charity auction,” the phrase can take two forms. 1. We can talk about organizing the event, meaning the multi-month plan needed to prepare for an auction (e.g. getting donations, marketing, securing a venue, etc.). 2. 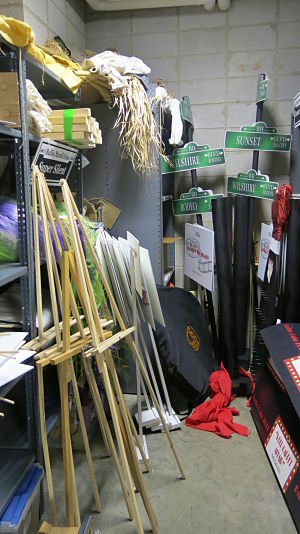 Or we can talk about organizing the physical “stuff” we often use annually when setting up the auction event. 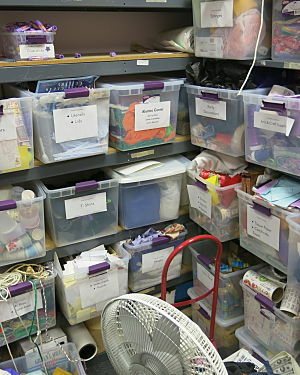 At this school, a large walk-in closet holds old decor items that can be re-purposed for future events. I’m talking about the latter. The top photo is from a nonprofit who uses an oversized closet as their storage facility. The other two photos are from a school’s “gala office,” which is a special room designated as the planning hub for the auction. As supplies (foam core, acrylic stands, markers, etc.) are bought for an auction, store and re-use what you can. It conserves your budget the following year. If you have enough space, you can store supplies in a closet or a room. Do you have any tricks for keeping your charity auction organized? If so, feel free to share your ideas below.